In stock -This product will ship today if ordered within the next 8 minutes. Lifestream Chlorella is a natural microscopic plant containing over 20 vitamins and minerals, 65% protein and is abundant in essential micronutrients and RNA/ DNA nucleic acids. It is nature’s richest source of Chlorophyll. As such, it has powerful cleansing and detoxifying properties. Unique to Chlorella is CGF (Chlorella Growth Factor) – its inherent genetic stability gives it the potential to help support and maintain the tissues, DNA and RNA. DNA is the master substance of life carrying all inherited traits and directing the activity of each cell. The detoxification capability of Lifestream Chlorella is due to its incredibly high content of chlorophyll and its ‘cracked’ cell walls. They have the uncanny ability to ‘grab onto’ unwanted materials, pollutants and some heavy metal residues and help support the body in the detoxification process. 100% Premium "Outdoor-Grown` Lifestream Chlorella 98.5%, calcium phosphate (anti-caking agent). Week One: 5 tablets per day. Increase to 10 – 20 tablets per day as required. Always use the label and use as directed. If symptoms persist see your Healthcare professional. Do not take Chlorella at the same time of day as prescription medication. Please seek the advice of a qualified healthcare professional if you are combining Chlorella with essential medication. Some people can initially experience changes in bowel motions, headaches, spots and tiredness during the early stages of a cleanse. These can be signs that your body is responding to the cleansing and detoxification process. They should subside and, in time, be replaced with a feeling of lightness, increased energy and well being. In the very rare case of vomiting or nausea or if intestinal pain or constipation continues, then discontinue use and seek healthcare advice. If you have a very sensitive digestive system or may be one of the very few people who have a micro-algae allergy, please check with your healthcare practitioner before using Spirulina, Chlorella or Ultimate Greens. Below are reviews of Lifestream Chlorella Tablets - 300 x 200mg Tablets by bodykind customers. If you have tried this product we'd love to hear what you think so please leave a review. 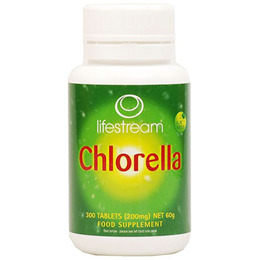 Question about Lifestream Chlorella Tablets - 300 x 200mg Tablets We have just discovered we had a lead pipe bringing water into our house and have been recommended chlorella. Can i give this to my 4 year old child? Which form of chlorella is most suitable for family use? Chlorella is an effective blood and organ cleanser and is especially effective at removing heavy metal toxins from the body. 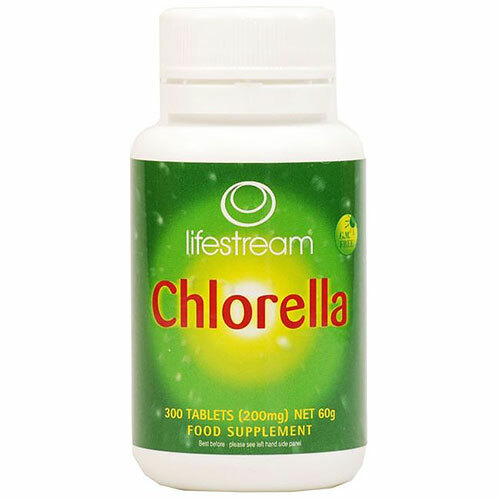 We would recommend the Lifestream Chlorella Tablets 300 x 200mg as these would be easier to take for smaller children. Or you could opt for the Chlorella powder, however, we suspect that your children will find the taste of the powder somewhat unpalatable and you may find it difficult to get them to take it. You can of course add both the tablets and powder to other foods to disguise the taste, however, these shouldn’t be hot foods and you should never cook Chlorella. Lifestream Chlorella is a natural microscopic plant containing over 20 vitamins and minerals, 65% protein and is abundant in essential micronutrients and RNA/ DNA nucleic acids.